t until a specified age (usually 12, 14, or 16 years.) In 1916, the NCLC and the National Consumers League successfully pressured the US Congress to pass the Keating-Owen Act, the first federal child labor law. However, the US Supreme Court struck down the law two years later in Hammer v. Dagenhart (1918), declaring that the law violated a child's right to contract his or her own labor. 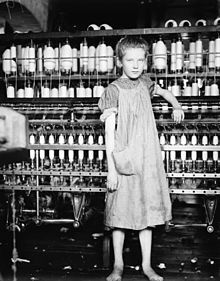 In 1924, Congress attempted to pass a constitutional amendment that would authorize a national child labor law. This measure was blocked, and the bill was eventually dropped. It took the Great Depression to end child labor nationwide; adults had become so desperate for jobs that they would work for the same wage as children. In 1938, President Franklin D. Roosevelt signed the Fair Labor Standards Act, which, among other things, placed limits on many forms of child labor. In 1994 the Arkansas state Federation of Labor placed a child welfare initiative on the ballot prohibiting child labor, which the voters passed. Human rights organizations have documented child labor in USA. According to a 2009 petition by Human Rights Watch: "Hundreds of thousands of children are employed as farmworkers in the United States, often working 10 or more hours a day. They are often exposed to dangerous pesticides, experience high rates of injury, and suffer fatalities at five times the rate of other working youth. Their long hours contribute to alarming drop-out rates. Government statistics show that barely half ever finish high school. According to the National Safety Council, agriculture is the second most dangerous occupation in the United States. However, current US child labor laws allow child farmworkers to work longer hours, at cdyounger ages, and under more hazardous conditions than other working youths. While children in other sectors must be 12 to be employed and cannot work more than 3 hours on a school day, in agriculture, children can work at age 12 for unlimited hours before and after school."